Coal costs used to be relatively stable, but recently have seen substantial increases and instability in prices similar to oil and natural gas. Steam cost from coal are highly variable due to handling and storage cost and waste disposal. For many years coal was about $50 per ton delivered. Heat Rate, or the rate at which coal is converted to steam by a boiler, varies with boiler type, size and efficiency. When coal is $50 per ton, the heat rate is about $2.50 per million BTUs, or 1,000 lbs of steam for fuel-only cost. Coal Handling adds $0.50 to $1.50 per million BTUs to the effective cost. The larger the system, the lower the coal handling cost per 1,000 lbs of steam. Emissions controls, such as bag houses, also add to the cost of burning coal. 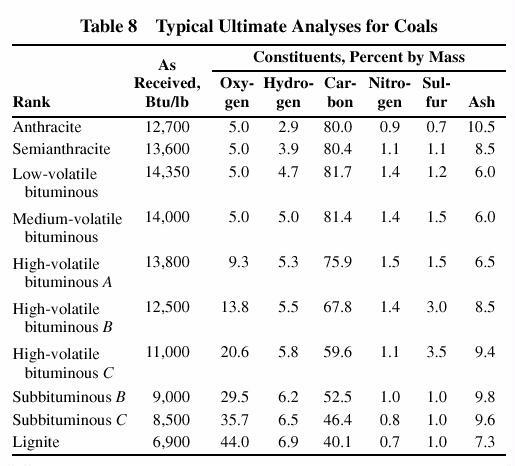 This classification is arbitrary because there are no distinct demarcation lines between coal types. Anthracite is a clean, dense, hard coal that creates little dust in handling. It is comparatively hard to ignite, but burns freely once started. It is noncaking and burns uniformly and smokelessly with a short flame. Semianthracite has a higher volatile content than anthracite. It is not as hard and ignites more easily. Otherwise, its properties are similar to those of anthracite. Bituminous coal includes many types of coal with distinctly different compositions, properties, and burning characteristics. Coals range from high-grade bituminous, such as those found in the eastern United States, to low-rank coals, such as those found in the western United States. Caking properties range from coals that melt or become fully plastic, to those from which volatiles and tars are distilled without changing form (classed as noncaking or free-burn-ing). Most bituminous coals are strong and nonfriable enough to permit screened sizes to be delivered free of fines. Generally, they ignite easily and burn freely. Flame length is long and varies with different coals. If improperly fired, much smoke and soot are possible, especially at low burning rates. Semibituminous coal is soft and friable, and handling creates fines and dust. It ignites slowly and burns with a medium-length flame. Its caking properties increase as volatile matter increases, but the coke formed is weak. With only half the volatile matter content of bituminous coals, burning produces less smoke; hence, it is sometimes called smokeless coal. Subbituminous coal, such as that found in the western United States, is high in moisture when mined and tends to break up as it dries or is exposed to the weather; it is likely to ignite spontaneously when piled or stored. It ignites easily and quickly, has a medium-length flame, and is noncaking and free-burning. The lumps tend to break into small pieces if poked. Very little smoke and soot are formed. Lignite is woody in structure, very high in moisture when mined, of low heating value, and clean to handle. It has a greater tendency than subbituminous coals to disintegrate as it dries and is also more likely to ignite spontaneously. Because of its high moisture, freshly mined lignite ignites slowly and is noncaking. The char left after moisture and volatile matter are driven off burns very easily, like charcoal. The lumps tend to break up in the fuel bed and pieces of char that fall into the ash pit continue to burn. Very little smoke or soot forms. Each of these is reported in the proximate analysis. Coal analyses can be reported on several bases: as-received, moisture-free (or dry), and mineral-matter-free (or ash-free). As-received is applicable for combustion calculations; moisture-free and mineral-matter-free, for classification purposes. Volatile matter is driven off as gas or vapor when the coal is heated according to a standard temperature test. It consists of a variety of organic gases, generally resulting from distillation and decomposition. Volatile products given off by coals when heated differ materially in the ratios (by mass) of the gases to oils and tars. No heavy oils or tars are given off by anthracite, and very small quantities are given off by semianthracite. As volatile matter in the coal increases to as much as 40% of the coal (dry and ash-free basis), increasing amounts of oils and tars are released. However, for coals of higher volatile content, the quantity of oils and tars decreases and is relatively low in the subbituminous coals and in lignite. Fixed carbon is the combustible residue left after the volatile matter is driven off. It is not all carbon. Its form and hardness are an indication of fuel coking properties and, therefore, guide the choice of combustion equipment. 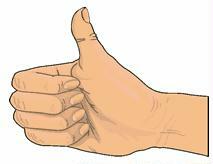 Generally, fixed carbon represents that portion of fuel that must be burned in the solid state. Moisture is difficult to determine accurately because a sample can lose moisture on exposure to the atmosphere, particularly when reducing the sample size for analysis. To correct for this loss, total moisture content of a sample is customarily determined by adding the moisture loss obtained when air-drying the sample to the measured moisture content of the dried sample. Moisture does not rep-resent all of the water present in coal; water of decomposition (combined water) and of hydration are not given off under standardized test conditions. Ash is the noncombustible residue remaining after complete coal combustion. Generally, the mass of ash is slightly less than that of mineral matter before burning. Sulfur is an undesirable constituent in coal, because the sulfur oxides formed when it burns contribute to air pollution and cause combustion system corrosion. Legislation has limited the sulfur content of coals burned in certain locations. where C, H, O, and S are the mass fractions of carbon, hydrogen, oxygen, and sulfur in the coal.